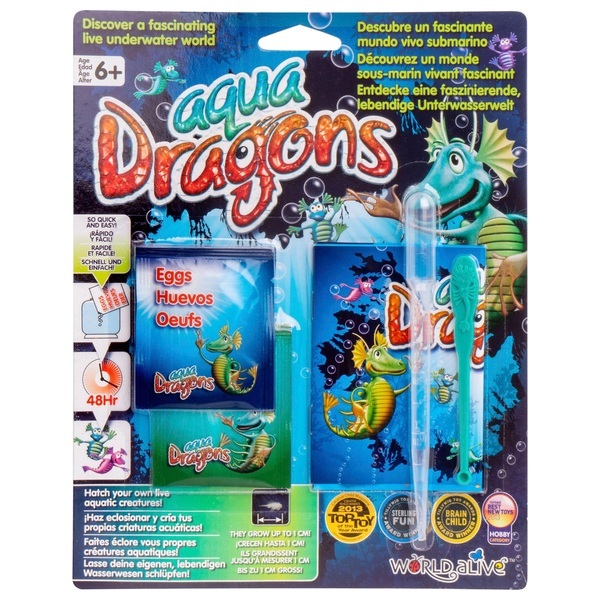 Aqua Dragons are live aquatic creatures which you can hatch and grow at home. These three eyed, long tailed gracious funny little swimming animals are from the crustacea family. Aqua Dragons eggs can be preserved in salt for long periods of time and hatched again once introduced into water! Caring for your Aqua Dragons you will see them eat, play, grow and learn about the differences between males and females and even how they reproduce. This backer carded kit allows children to use their own container - a clean jam jar or plastic tub for example - to grow Aqua Dragons at a pocket money price. The pack includes preserved eggs, food, pipette, feeding spoon and full instructions. Just add bottled water and they miraculously hatch within just 2-3 days. The experience also includes signing a responsible Aqua Dragons ownership certificate, learning about the life cycle and anatomy of the creatures as you watch them swim and play in their tank. The perfect first pet. This product canlso be used as a Refill Kit for Underwater World or Deluxe.